Villa South Point is an oceanfront vacation residence epitomizing period elegance. Warm and bright interiors are appointed with predominantly excellently crafted and intricate wood furnishings and fixtures along with timber and woven wood pieces as well as British and Dutch colonial accents. Amenities are discriminately five star – for all-out guest delight and enjoyment. 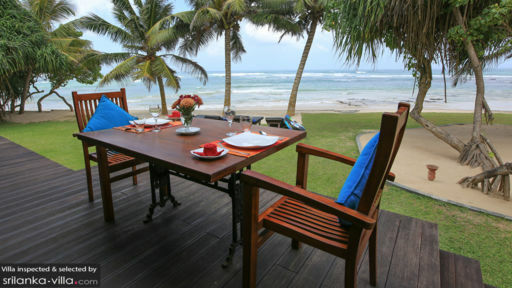 Villa South Point, truly, affords you fine vacation living with an old-fashioned, seaside ambience. The villa has three bedrooms. The Master Bedroom has a draped, king-sized bed as well as a dedicated bathroom with dual sinks and a rain shower. The Sea Room has two draped, queen-sized beds as well as a dedicated bathroom with dual sinks and a rain shower. Both the Master Bedroom and the Sea Room have direct access to the oceanfront garden. The Pond Room also has a draped, king-sized bed as well as a dedicated bathroom with dual sinks and a rain shower. The Pond Room opens out to a carp and lily pond. Bordered by mangroves is the 12-meter swimming pool. After your morning dip in the ocean, give in to the swimming pool’s beckoning, glassy waters and continue your communion with your favorite element. For some sun, you can lie on cushioned, wooden pool beds on the garden’s well-maintained lawn under the shade of towering palm trees. At the villa’s spacious and breezy common area are two living areas. The indoor living area – with its cushioned, wooden reclining chairs – is behind the indoor dinner table. The alfresco living area – with its long, woven wood reclining chairs – is on the villa’s covered terrace. Around these two sitting areas, you can all converge for moments of family or friendly bonding. There are the also two dining areas. The indoor dining area – with its timber wood table good for six – is at the center of the common area. The alfresco dining area – with its wooden table good for eight – is also on the covered terrace across the alfresco living area. At any of these dining areas, you can all have your fill of authentic Sri-Lankan specialties – as well as foreign fare – freshly cooked by the onsite chef at the villa’s well-equipped, modern kitchen. Although candlelit dinners can also be arranged out on the garden – by the beach – especially on breezy evenings. In charge of carrying out the day-to-day services of the villa is an efficient, friendly staff headed by a manager backed by a personal guest assistant, a pool attendant, a gardener as well as housekeepers and security personnel. Aside from the chef, a babysitter, a driver and a laundry helper may be called in upon your request. Their services, however, come with a separate charge. Bike, car and boat rentals are also available. 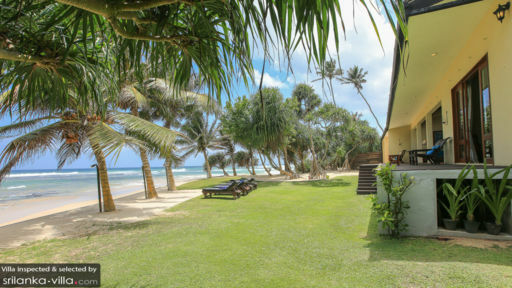 Villa South Point is located in Ahangama. Spend separate days at Unawatuna Beach – where you can go swimming in the bay – and at Mirissa Beach – where you can go surfing. Hire an elephant for a day-long, close encounter with this gentle giant. On your next tour, go see Galle Fort – a UNESCO Heritage Site – and the Handunagoda Tea Plantation And Factory. On a separate excursion, go nature tripping at the Turtle Hatchery, the Hambantota Bird Park, the Drive-Thru Zoo, the Undalawe and Yala Wildlife Parks and the Sinharaja Rainforest. During the months of October to April, whale and dolphin watching expeditions can be arranged at Mirissa and Galle. This was our second holiday at South Point Abbey. Our first holiday was outstanding. Could it be better. YES. This time we decided to catch the train from Colombo and got picked up about 20 minutes away from the villa. The train was wonderful, spacious, air conditioned, wifi (kids were happy). It was great to arrive at the villa, the staff were excited to see us and for the next 8 days they looked after us so well. The villa was beautiful, rooms were wonderful, food was out of this world! We swam in the ocean twice a day and spent the rest of our time round the pool with the kids. Both families have now decided that we will make this trip an annual one. I did not want to leave. Quote of the trip '' this must be how movie stars feel on holiday''. The staff are beautiful people, they played with our kids and taught them local dances, Nothing was ever a problem for them. Chef is the best! He seems to be continually excited and passionate about his cooking, the food he prepares is the best food I have ever eaten. The most relaxing holiday ever. Thank you South Point Abbey! Wonderful location, the service was just perfect, the chef was excellent and we even got fresh lobster from the fishermen. The beaches in this area are absolutely wonderful and we enjoyed very much the visit to the owner's family tea plantation. Galle Fort is such an inspiring place to visit and have dinner at the Fort Printers, a beautiful hotel/restaurant in an old Dutch mansion. 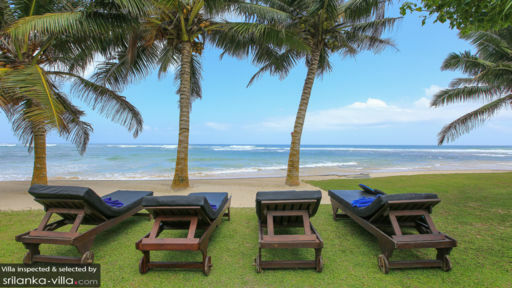 If you go to Sri Lanka, South Point Villa is an excellent choice. Thank you for the wonderful cooking and the fantastic service. I will always remember my stay here. Our stay at South Point really has been perfect. You staff are incredibly welcoming, helpful and eager to please. We very much appreciate the time Maiti's father took to show us around the family's tea plantation. We will of course be tilling our friends, family and colleagues all about South Point Villa, and of course about Sri Lanka. We very much hope to return soon.